This debut fantasy is set in the Risen Kingdoms, where countries float in the air and people take airships from place to place, princes battle for a throne, and dashing musketeers defend feisty princesses. In other hands, this would be a swashbuckling gaslamp romp, but author Craddock chooses to go darker. His princess, Isabelle des Zephyrs, cousin of His Imperial Majesty Leon XIV of L’Empire Céleste, is feared for her deformed hand and abused by her father and brother for failing to possess their family’s saint-given magic, the ability to drain the life from others with the bloodshadow. Her only refuges are her trusty protector, the musketeer Jean-Claude, and her secret work as a scientist and mathematician, pursuits forbidden to women on pain of death. Saintly lines are supposed to remain pure, so Princess Isabelle can’t understand why the younger prince of Aragoth, who bears his own royal family’s gift of traveling through mirrors, would wish to marry her; nevertheless, she welcomes the opportunity for a new life… The skulduggery is pleasurably complex, the emotional stakes feel convincing, and the reasonably happy ending feels earned. And while Jean-Claude’s doggedness in protecting Isabelle is admirable, Isabelle is decidedly and enjoyably not a damsel in need of rescue. 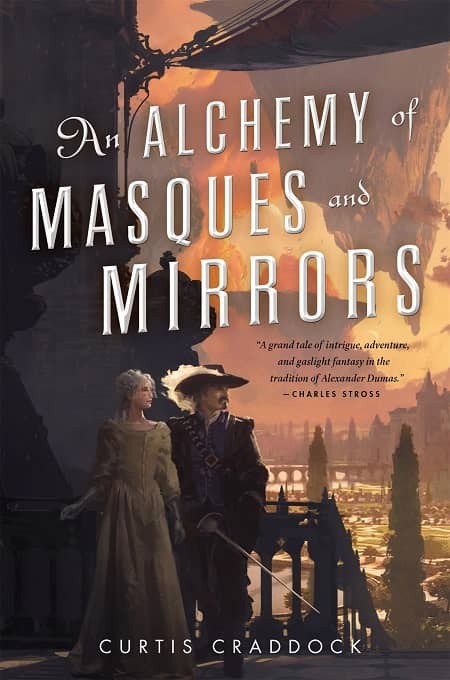 Charles Stross calls it a “gaslight fantasy in the tradition of Alexander Dumas,” and admittedly that’s the quote that got my attention. 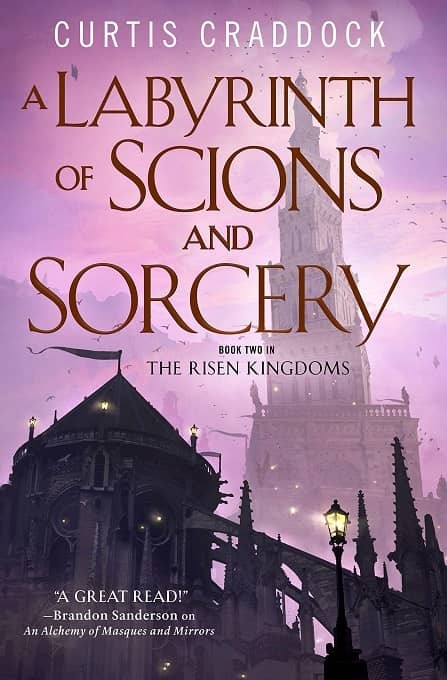 The second book in the series, A Labyrinth of Scions and Sorcery, arrived last week, offering more tales of “adventure full of palace intrigue, mysterious ancient mechanisms, and aerial sailing ships!” (David D. Levine). Here’s the description. We previously covered An Alchemy of Masques and Mirrors back in 2017. Here’s the publishing details for both volumes. Both volumes were published by Tor. The covers are by Thom Tenery. Get more details (including cool maps!) at the author’s website. See all our recent New Treasures here. More books that I desperately need to read after I finish all of the other books that I desperately need to read or to reread. Why is it that I’m more interested in a book when it turns out to be part of a series? Maybe it’s because I have time to read so few series to completion… and we’re constantly drawn to things we can’t have.